Allen and Heath Club Partch Bay for DVS systems DJParts - All Variety of Parts that DJ Needs. The Allen & Heath Xone:PB Patchbay is a 19-inch rack mountable passive patchbay with RCA I/O connections. The Xone:PB Patchbay is designed to provide easy connection between a turntable / CD deck DJ rig (or booth), and time-coded DJ software systems. Laptop DJs can easily connect their audio interfaces to the Xone:PB Patchbay, without the inconvenience of awkward DJ change-overs and cumbersome mixer rewiring during a busy DJ set. The Xone:PB Patchbay easily accommodates a pair of audio interfaces, simplifying laptop DJ changes without missing a beat. The panel features Mixer Input connections for up to 4 channels. The Deck Output section accommodates 2x turntables and 2x CD decks, with 2x outputs per deck for simultaneous connection of up to 2x audio interfaces. 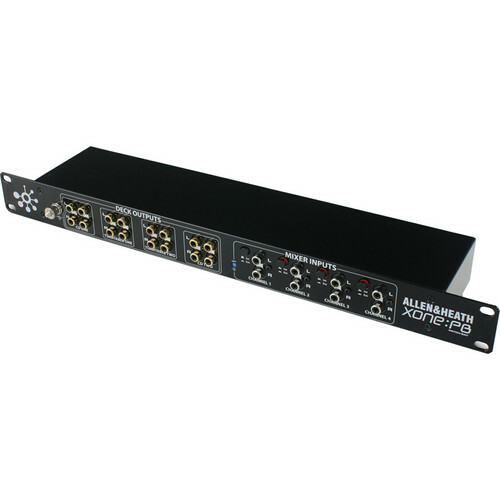 The Allen & Heath Xone:PB Patchbay is a wise choice for fixed installation in professional nightclub DJ booths, broadcast applications and more.